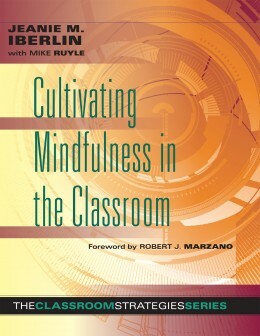 Why is practicing mindful attention important for students? How does stress negatively impact the body? How does the glitter jar activity help students visualize nonstop thinking? When students can mindfully pay attention and focus for longer, they are more engaged in school and can attend to instruction for sustained periods. They are less likely to get distracted and miss important information. Mindfulness also helps moderate extreme attention tendencies such as obsessiveness, hyperactivity, lack of concentration, and apathy (pp. 35–36). Breathing exercises reduce stress and lower one’s heart rate. They also increase blood flow, which brings more oxygen to the brain, increasing one’s ability to learn (pp. 21-24). The glitter in the water represents nonstop thinking; it swirls around and obscures the water like intrusive thoughts obscure clear thinking. When the glitter settles to the bottom of the jar, it represents times when the mind is calm and clear (pp. 24–25).